You can fax a simple note by sending just a cover page. Select Tools, Fax Printer Configuration to display the Fax Properties dialog box. If you have multiple fax/modems installed on your computer, select the fax/modem you want to use to send faxes. Click Properties. The modem’s property sheet appears. Enable Device to Send Activate this check box to enable the Fax service’s Send feature. 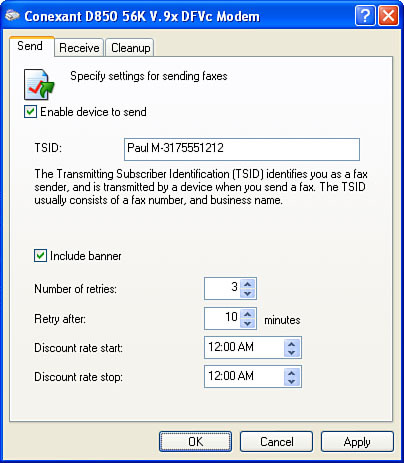 TSID Use this text box to type the transmitting subscriber identification that appears at the top of all your outgoing faxes. Include Banner When you activate this option, the Fax service includes text banner across the top edge of each page of the outgoing fax. This text includes your TSID, page number, and the recipient’s fax number. Number of Retries This value determines the number of times the Fax service attempts to send a fax if it encounters a busy signal or some other error. Retry After This value determines the number of minutes the Fax service waits between retries. Discount Rate Start You’ll see later on that you can tell the Fax service to send a fax “when discount rates apply,” which means when your phone rates are discounted (such as after midnight). Use the Discount Rate Start spin box to specify the start time for your discounted phone rates. Discount Rate Stop Use this spin box to specify the end time for your discounted phone rates. Figure 2. Use the Send tab of the modem’s property sheet to configure the Fax service’s sending options. Click OK in each open dialog box. In the Fax Console, select File, Send a Fax. From the Printers and Faxes window, click the task pane’s Send a fax link. Alternatively, select File, Send Fax. Select Start, All Programs, Accessories, Communications, Fax, Send a Fax. The initial dialog box isn’t much use, so just click Next to continue. The Send Fax Wizard displays the Recipient Information dialog box, shown in Figure 3. Figure 3. The Send Fax Wizard takes you through the steps necessary to send a simple cover page fax. If the recipient is in your Address Book and you have the Fax field filled in (in either the Business or the Home tab), click Address Book, select the recipient, click To, and then click OK. 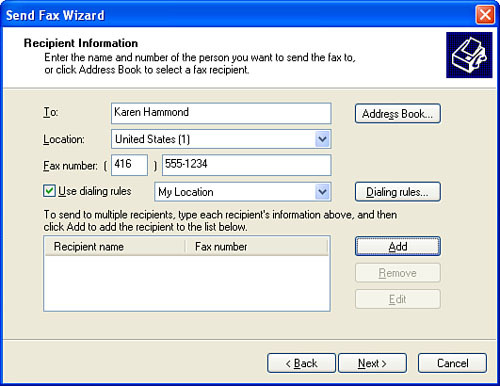 The Send Fax Wizard adds the person’s name and fax number to the recipient list. To Type the name of the fax recipient. Location If you’re calling long distance and you need to start the dialing with a number other than 1, activate the Use Dialing Rules check box and then use the Location list to select the country code for the fax recipient’s phone number. Fax Number Use these two text boxes to enter the area code (if necessary) and phone number for the fax recipient. Note that you can’t enter the area code unless you activate the Use Dialing Rules check box. Click Add. This isn’t necessary if you’re sending the fax to a single recipient or if you inserted the recipient via the Address Book. If you want to send the fax to several people, repeat steps 2 and 3 as necessary. When you’re ready to move on, click Next. The Preparing the Cover Page dialog box appears. Cover Page Template Select the cover page you want to use. Subject Line Type the subject of the fax. Note Type your cover page message. Set the fax priority to High, Normal, or Low, and then click Next. In the final wizard dialog box, click Preview Fax to check out the fax in the Windows Picture and Fax Viewer. When you’re ready to ship the fax, click Finish. The Fax Monitor window replaces the wizard so that you can see what’s happening with the fax. The other (and probably more common) method of sending a fax is to send a document directly from an application. You don’t need applications with special features to do this, either. That’s because when you install the Fax service, it adds a new printer driver to Windows XP. This printer driver, however, doesn’t send a document to the printer. Instead, it renders the document as a fax and sends it to your modem. Create the document that you want to ship. Select the program’s File, Print command to get to the Print dialog box. Select Fax as the printer and then click Print. The Send Fax Wizard appears. Follow the steps outlined in the previous steps to set the fax options. With this method you don’t have to bother with a cover page. If you’d still like to include one, activate the Select a Cover Page Template with the Following Information check box when you get to the Preparing the Cover Page dialog box. You can use Windows XP’s Photo Printing Wizard to fax a scanned image or photo. After you scan the picture, right-click the resulting file and then click Print to start the Photo Printing Wizard. (If you have the task pane displayed, you can also select the file and then click the Print this Picture link.) Click Next in the first two dialog boxes. In the Printing Options dialog box, select Fax in the What Printer Do You Want to Use? list. Click Next in the rest of the wizard’s dialog boxes. When the wizard “prints” the image, the Send Fax Wizard appears.